Beel loves it! 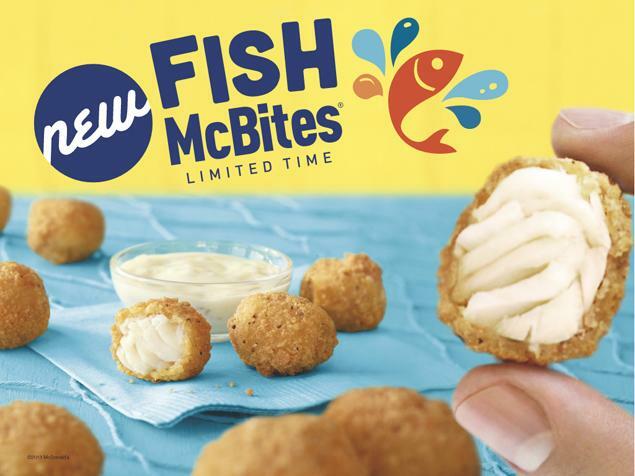 CBS News recently reported “Fish McBites fail to spark McDonald’s sales.” Well of course they failed, they’re terrible (see Beel’s review). Google Trends analysis for “fish McBites.” (graphic source: Beel) Click on graphic to embiggen. 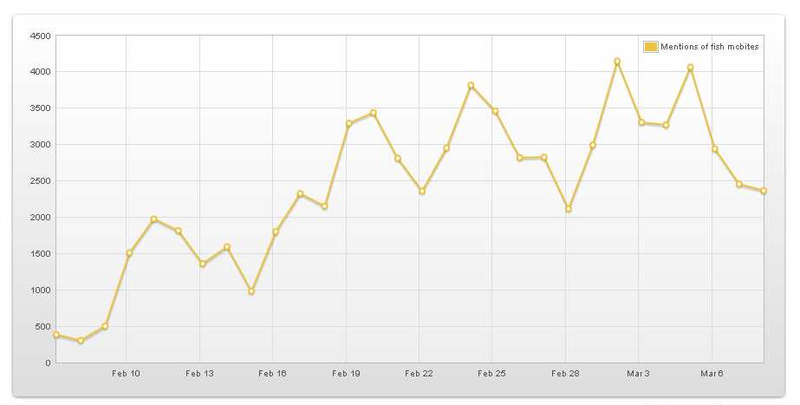 McBites were tested last spring, for a brief period, and you can see that a low volume of searches was made at that time. There is a small blip in September 2012, which probably resulted from a statement by McDonald’s that the product would be back in 2013. Announcements were made in December 2012 and McBites were launched in 2013, the rest is history. Beel thinks it is too early to make many conclusions, other than that McBites will not last. Beel’s review and those of those have not been kind. Topsy Analytics results for “fish McBites.” (graphic source: Beel) Click on graphic to embiggen. Over the past month there has been an increase in the number of tweets that reference McBites. 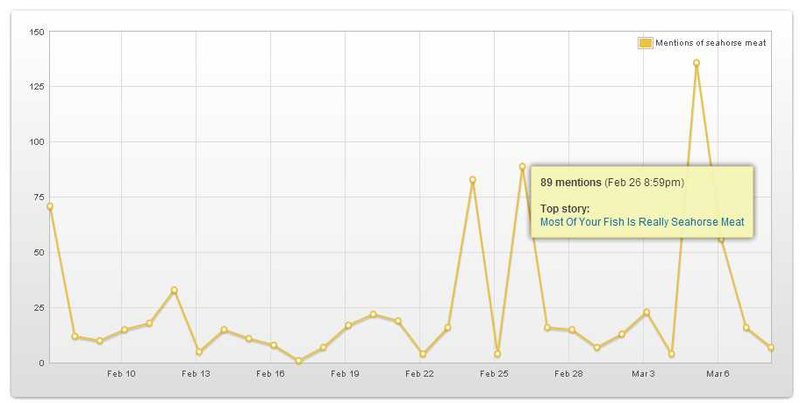 Most of the peaks follow news reports about the product and, largely, retweet or comment and retweet these reports. But strangely, on some days there was a large number of tweets claiming that McDonald’s Fish McBites (and other fish products)contained seahorse meat. Here are the top tweets on other days, as we see the evolution of the myth that McBites contain seahorse. 7 February 2013: fish fingers have seahorse meat i them? 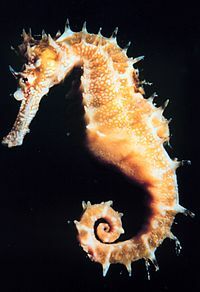 10 February 2013: Burger King’s BK Big fish sandwich contains seahorse meat. 11 February 2013: It’s only a matter of time before we find out McDonald’s new Fish McBites are full of seahorse meat. 26 February 2013: Most Of Your Fish Is Really Seahorse Meat. 1 March 2013: BREAKING: studies show food at Captain D’s contains Seahorse meat. 6 March 2013: BREAKING: Seahorse meat found in Fish McBites. 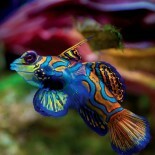 Now, here is what a seahorse looks like. It you can get meat off of it, G’donya as the Aussies would say. Here’s the real Beel deal: Beel was having a couple of glasses of wine while reading up on all of this. Rest assured, there was much laughter in the den Stormer household! This entry was posted on March 9, 2013 by denstormer in Beel Bemused, Commentary, Google Stuff and tagged Google Trends, queryomics, Topsy Analytics, Twitter, USA.